This new variant of the Harrier Industrial aircraft is available with 6 and 7 series drive options offering payload capacities to 15 Kgs. The two key features of this variant is the resistance to precipitation and to also to higher temperature environments. The aircraft has a cover for water resistance and also second layer of sealing under the cover to prevent any chance of water getting to flight critical systems. Batteries are carried on the side of the aircraft and fitted with easy access custom water proof covering. For high temperature operations a dual in / out vent and fan system is fitted with a multi path airflow pattern preventing water coming in with the air. Covers are available in white for the high temperature variant, but also in black, or high visibility colours such as orange if required. The Harrier Industrial range covers an ever increasing number of variants aimed firmly at industrial applications, and cover flight weights up to 35 Kgs. Harrier aircraft vary in size and configuration but are most commonly X8 folding frames that are highly adaptable to different roles, flight characteristics and payloads. 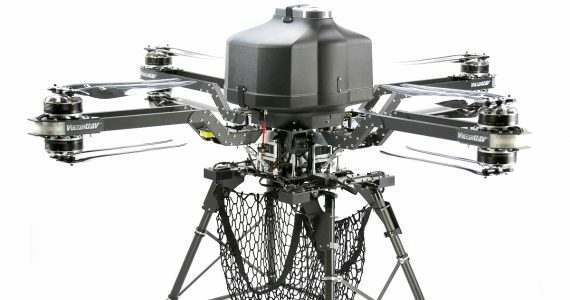 Common features are a number of quick release anti vibration mounts, quick detach fixed landing gear, custom gimbals and payload mounts, parachutes, proximity sensors and more. This aircraft shown here (right) is an asymmetric XY8 fitted with a large custom full up / down gimbal and FLIR G300 gas sensing camera. This aircraft can fly for around 30 mins at 20 Kg AUW with recommended batteries whilst maintaining a high level of resilience in difficult conditions. Another variant (shown left) is an X8 configuration fitted with the RouteScene LidarPod. A set of quick detach fixed landing gear is used to allow the Pod to be easily removed and cased while still installed in the landing gear, making for quick and simple deployment and secure transportation. As with all Harrier variants electronics are enclosed and protected against interference or damage, with air vents and fans installed as required. This does not constitute weather proofing as such, but will offer some protection if you are caught out in a shower. All Harrier frames can be easily and quickly folded for transportation using the well proven Vulcan tool free cam lever and safety latch system. The Airlift series represent our heaviest lift systems to date, with payload capacities of up to 25 Kgs. 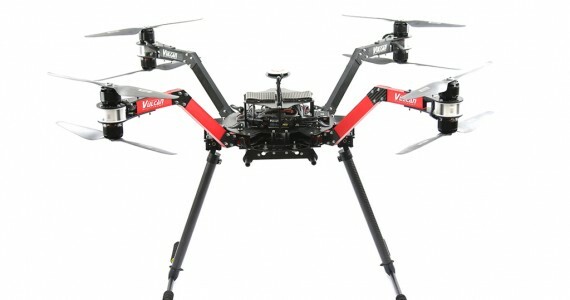 The design features an extremely tough and resilient airframe, cross braced for ultimate strength and stiffness. The central core is a sealed transparent tube allowing visual checks of the all control systems, whilst keeping them fully protected. All key power electronics, communication and batteries are fitted on top of the aircraft and can be quickly and easily covered with our ‘shower cap’ waterproofing system as used in the new Ranger series aircraft. This renders the entire aircraft quickly and easily water resistant and capable of flying in some of the worst weather. The Airlift also features a unique folding system that allows the airframe to be reduced to a very manageable size when folded for transportation or storage, especially impressive when considering the overall size and capability of the aircraft. Applications for the Airlift include crop spaying, wire pulls between power poles or across valleys, maritime search and rescue, popup communications systems, offshore delivery and more. 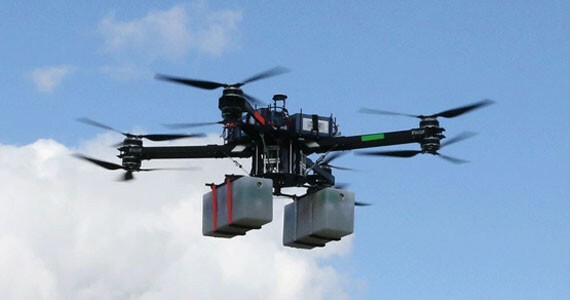 The Mini 8 has been designed to meet the needs of those operating in congested areas where flight weight needs to be kept to a minimum, but without a reduction in system redundancy. Normal flight in the case of motor loss can only be achieved with an 8 motor aircraft, a 6 motor aircraft should stay in the air but with compromised yaw control, and a 4 motor quad cannot fly at all in the case of any drive failure. To this end the Mini 8 was designed. At 3.4 Kgs dry weight and a maximum flight weight of 8 Kgs, this leaves ~ 4.6 Kgs of flight weight to be used for batteries and payload. 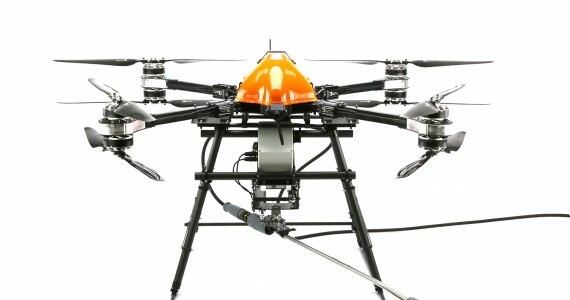 The balance between the two is up to the operator and will depend on the requirements of the flight and payload. This aircraft is capable of flying more than 30 mins with no payload, and over 15 mins with a payload of 1.8 Kgs (using a 16Ah 5s lipo @ 1.75 Kgs) giving an AUW just under 7 Kgs. 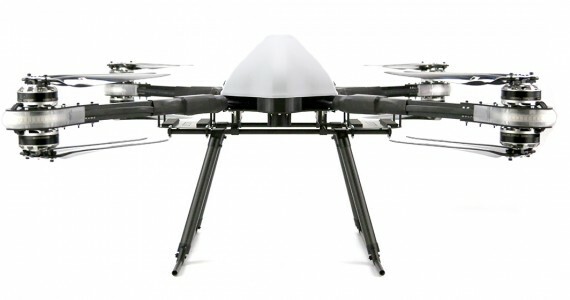 It can be fitted with retracts or fixed landing gear, anti vibration mounting, includes built in FPV camera if required, and can be folded quickly without tools for transportation. This aircraft is also extremely quiet! 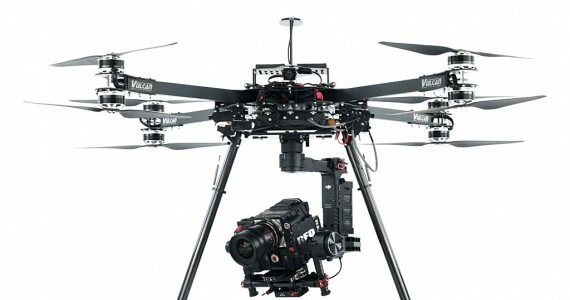 The Raven is our main work horse heavy lift multicopter aimed at aerial photography and camera work. 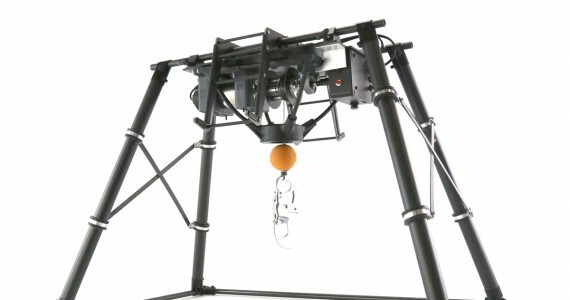 Designed for take off weights up to 25 Kgs the Raven is more than capable of lifting a 10 Kg payload whilst maintaining a high level of speed and manoeuvrability. Made from high grade pure carbon fibre and custom manufactured 6061 grade aluminium, this is an extremely tough, folding aircraft in X8 configuration, designed with ultimate safety in mind, and built to withstand the rigors of real world commercial use. 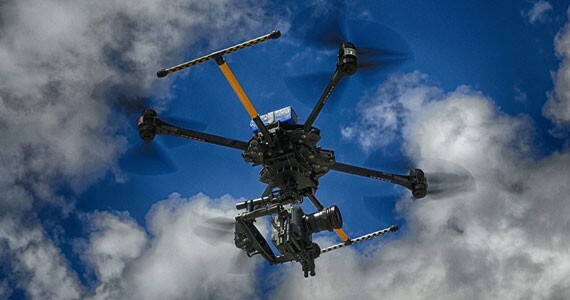 The Raven was the first aircraft to successfully go through the CAAs CAOSC assessment process, and to this day a Raven still has the highest risk exemption ever granted in the UK. 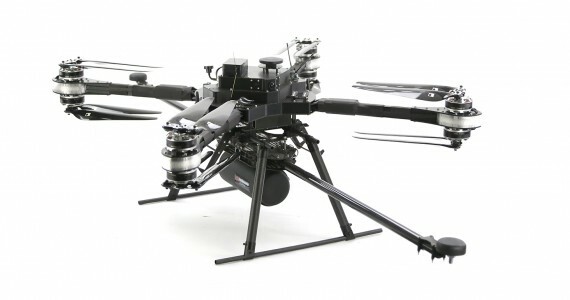 It is used by many of the top movie industry flying camera companies both in the UK and abroad, and a 12 motor variant was the only multi copter to be allowed to fly at the Rio Olympics 2016 with three aircraft carrying out over 350 flights over the two weeks of the games. A number of variants of the Raven have been produced, and as with all our aircraft customised versions to meet specific criteria are available if required. 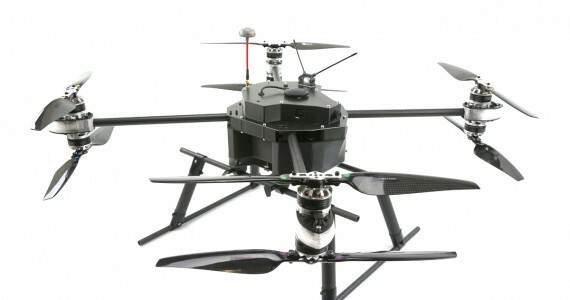 Shown here (right) is the UAV smart winch developed by us for delivery of light payloads to areas where landing is not possible (such as the top of wind turbines), or for placing of equipment or sensors in hard to reach or no access locations (with the addition of our remotely operated dropping hook – not shown here). The smart winch is integrated into one of our removable quick release landing gear systems for quick swapping of different payloads for different functions. 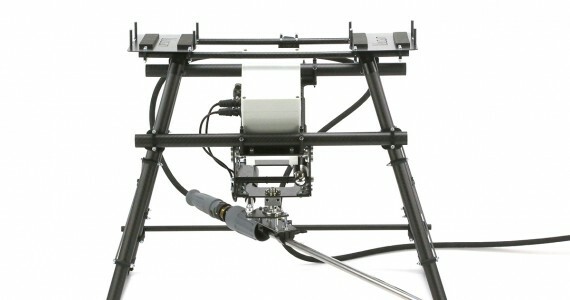 Shown left is a custom remotely operated robotic spray system designed for use in harsh environments. The spray arm is supplied from the ground using a high pressure industrial pressure washer, with the water being pumped by armoured hose up to a maximum height of around 20m. The operator can move the sprayer arm in two axes remotely and see where it is pointing from an on board camera. This system was designed an built from the ground up to operate off shore in the North Sea on the new extra large wind turbine fields now under construction. 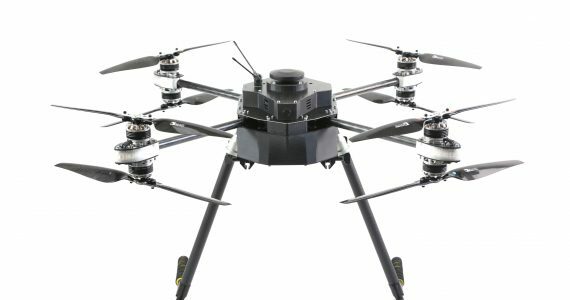 The Black Widow is one of our most popular designs and is ideal for aerial photography, structural inspection, surveying, and other medium lift tasks where high levels of reliability and a clear sensor view are important.The co axial X8 configuration gives good performance in wind, and plenty of lift for carrying medium to heavy loads, whilst also offering very good redundancy against failure. The frame is tough and solid, and includes our tool less quick fold mechanism for ease of transportation and storage. 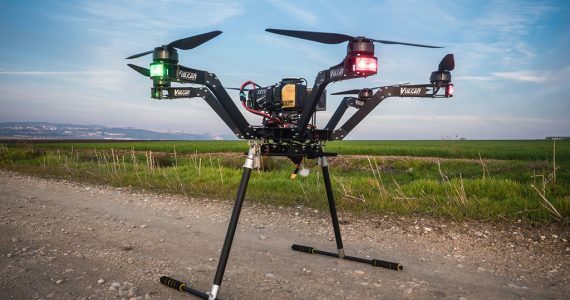 A well proven anti vibration system and standard payload mounting rails are available, as well as the option for wide spaced retractable landing gear giving plenty of room for a centrally mounted gimbals. This is a fast and highly manoeuvrable aircraft, that offers great stability and good resistance to wind. 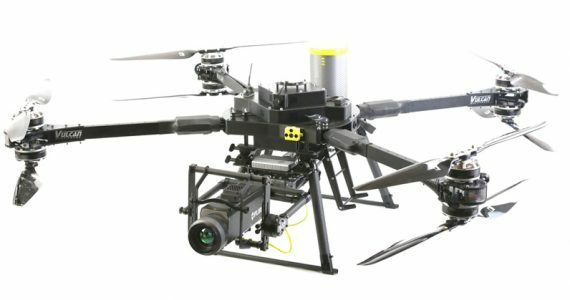 The use of Z arms gives great 360 degree view for the camera without getting props in the shot, ideal for both aerial photography and structural inspection where a clear all round view from the camera is required. The Black Widow is now available in both X8 and Hex configurations. It can supplied as a frame for the self builder or as a Ready to Fly aircraft. As with all our ‘standard’ airframes the Black Widow can be adapted or customised as appropriate for a range of applications and requirements.